He was asked about sexual harassment allegations in Canadian politics. Prime Minister Justin Trudeau speaks with media after announcing the government's recognition of the UN's International Decade for People of African Descent. The lack of questions about black Canadians at a government press conference focused on the experiences of black Canadians shows how their stories are not "top of mind" for the broader community, according to one advocate. 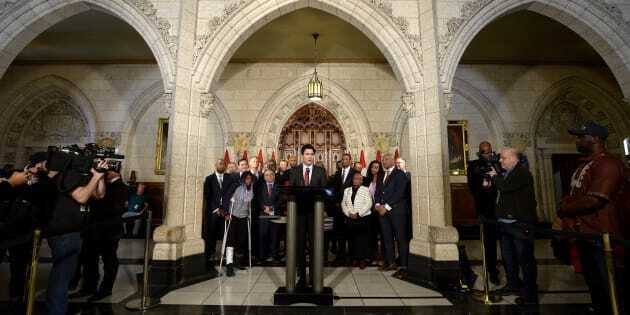 On Tuesday, the federal government held a news conference in the foyer of the House of Commons to announce it would be officially recognizing the Decade for People of African Descent. The UN initiative, which runs from 2015 to 2024, aims to recognize, promote and protect the achievements and freedoms of people of African descent. Prime Minister Justin Trudeau said embracing it in Canada will help address "the very real and unique challenges that black Canadians face." After the announcement, Trudeau — joined by black MPs as well as members of the Federation of Black Canadians and the federal black caucus — took questions from reporters. None seemed to be directly related to the initiative or the experiences of black Canadians. Instead, Trudeau was asked about the recent wave of sexual harassment allegations in Canadian politics, including whether the #MeToo movement has led him to reflect on his own past behaviour. "What we were able to bear witness to today was the fact that the media was more engaged with other issues — not to suggest that they shouldn't be engaged with other issues — but they were engaged with other issues to the exclusion of the issue that they were there for," Justice Donald McLeod, an Ontario judge and chair of the Federation of Black Canadians, told HuffPost Canada. "I felt that it was hard to stand there and see, but it was a stark reminder of where we are." Mojdeh Cox, an anti-racism activist who works with the Canadian Labour Congress, told HuffPost Canada there was initially an "aura of hope" in a nearby room full of people watching Trudeau's remarks. "The room, when I walked in, was full of really vibrant, hopeful black leaders from across party lines, from different sectors representing a variety of different organizations," Cox said. The mood changed soon after Trudeau began taking questions. "And then it became one of those situations where one question came and we were like, 'Oh, so we got derailed. All right. It's OK. We'll get back on topic.' And then it was the second and third and fourth question that was asked that wasn't directly aligned with the issue at hand at all." "The room really sank into a whole different mood when we realized that essentially the press conference was hijacked by journalists on the Hill," she said. Immigration Minister Ahmed Hussen, who was also at Tuesday's press conference, told HuffPost he expected at least a few questions from the media about the initiative. "It's difficult to know what the media will be interested in in a given day," Hussen said. "But yeah, I was a little surprised." Prime Minister Justin Trudeau speaks with media during an availability in the foyer with his caucus on Parliament Hill, in Ottawa on Jan. 30, 2018. Cox stressed that she has nothing against journalists and the media, and understands there are elements in the profession that are more "nuanced" than most people can imagine and that the issue of sexual harassment is very important. But she said Tuesday's conference shows that there is a gap in representation that needs to be addressed. "This is a clear example why we need to diversify people who cover stories. How do we tell stories that are not ours and make space for people to tell the stories that are theirs?" "It was very, very disappointing and heartbreaking to feel the energy drain out of that room." McLeod said he also felt the mood shift, but he had a more optimistic take. "I wasn't in the room but I can say, standing outside right there behind the prime minister, that my mood would have been the same as theirs. But I think I'm appreciative for that mood because it allows me to know just how far from the mark we are," he said. "It lets us know that we're not top of mind, and if we're not top of mind for the rest of the community, then in many respects we still have a far way to go." Justice Donald McLeod, chair of the Federation of Black Canadians, said the government's recognition of the UN's Decade for People of African Descent is a "good next step." Tuesday's event has been in the works since 2016, said McLeod, when advocates began preparing a series of working papers on mental health, corrections and education for the government. The work led to two meetings last year, one with Trudeau and another with his principal secretary Gerald Butts. But McLeod stressed that the group will remain non-partisan in its work to advance solutions involving the black community. Recognizing the UN initiative means committing to a better future for black Canadians, Trudeau said, "where they experience full and equal participation in society across political, social and economic life." McLeod said he was happy that Trudeau acknowledged both anti-black racism and systemic racism. He sees Tuesday's announcement as a "good next step" in highlighting the issues pertaining to black Canadians. "I don't think that we can say that we have arrived, we're simply on our way," he said.